Ever since my nine-year-old self sat down with my family to feast on burgers and fries at the 50’s Diner on Session Road in Baguio City, I’ve had a soft spot for diner food. A plate’s got all my favorite food groups (carbohydrates, protein, and fat), making it the ultimate comfort food. I’ve never met a diner I didn’t like, simply because I stick to the foods that diners excel at: burgers, fries, and milkshakes. One of my friends from high school, Tin Isidro, opened a place called South Diner last December 5 with her husband Ginno and some business partners. Due to hectic schedules I wasn’t able to attend their soft opening, but tonight was the perfect time to bring together some of my friends for a girls’ dinner out. I arrived earlier than Julia and Chok, the other two girls I was having dinner with, which was funny since I came from Pasig and had traveled all the way down south (anything south of BGC Taguig seems really far to me), while they were just within the area. Right from the get-go, the huge retro-style sign grabbed my attention. The interiors also did not disappoint, with the cheery red-and-white upholstery, checkerboard flooring, and waiters and waitresses in uniform. The only thing missing was a jukebox, but Tin explained that a genuine vintage jukebox cost around P150,000 (yikes!). Anyway, what I was really after was some food. An hour’s drive (without traffic) makes me a hungry diner. What this table needs is some food! The menu has several sections,and depending on your food mood you could be ordering breakfast (available all day), sandwiches, steaks & ribs, kiddie meals, and the usual suspects burgers & fries. For sweets, there are dessert selections, and different flavors of milkshake with a choice between regular or extra-thick texture. Paying no heed to the growing spare tire around my midsection, I ordered my favorite diner combo. Was I hungry, or was I hungry? It may not look like much, but diner food has always tasted better than it looks. This burger is their Philly Bacon Jack (P145), with bacon and Monterey Jack cheese over a real beef patty. I gotta tell you, that burger was incredibly filling. The beef patty was heavy, without extenders. Fries weren’t very greasy since they’d just come out of the fryer. In combination with a strawberry milkshake (P95), I was in heaven! The food arrived within 10 minutes of when my order was taken. Because I hate allowing food to get cold, I finished it in about the same amount of time. Well, I had to leave a morsel of the burger on the plate because I was just too full! But I wasn’t done with eating yet. When Julia finally arrived two hours later, she ordered one of South Diner’s best-sellers: the Porky Pig (P140). It’s two pork chops encased in batter, fried, and topped with applesauce, served with two fried eggs, mango salsa, and your choice of garlic rice, plain rice, or mashed potatoes. Despite the diner being nearly full, Julia’s dish arrived quickly. Often I encounter pork chops that have been overcooked so that the meat inside is tough; the only thing that makes it palatable is the sauce. This pork chop dish, though, was unexpectedly moist and tender all the way through. The highlight for me though was the mashed potatoes, which were made with real potato and butter, slightly chunky. I’m drooling again now just thinking about it. South Diner is at 303 Aguirre Avenue, BF Homes, Paranaque beside PureGold. I’ve been traveling to the same place repeatedly for two years, so I was truly happy that Nuffnang Philippines tagged me along with other guest bloggers and the Philippine finalists to the 2011 Nuffnang Asia Pacific Blog Awards. It was an amazing and exciting four days traveling with some of the country’s most interesting bloggers (in my honest opinion)! So, the weekend I’m out of the country enjoying myself in Malaysia, a typhoon devastates Cagayan de Oro and other provinces. I was on BlackBerry Unlimited services with DiGi, a Malaysian provider, so I was able to read Twitter and keep up with the news. It didn’t quite hit home, though, until my friend Joel sent us some pictures over BBM. I met Joel many years ago in Boracay. We go to the same church and are part of the same triathlon team, and I consider him one of the most level-headed sane guy friends a girl can ever find. He got married last year, and he and his wife Audrey relocated to CDO with her daughter, Nicole. According to Joel, there were so many business opportunites to be had in CDO and he was really excited to build a life there. They had just welcomed a baby daughter, Sandy, to their family a few weeks ago. And then, Typhoon Sendong came. Water reached midway up their second floor. Joel, Audrey, Nicole, and Sandy are fine, but the home they had so carefully made for themselves was brutally devastated in just a few hours of rain. And they’re not alone; many other CDO, Iligan, and Zamboanga residents escaped with just their lives — and some didn’t. My friends and tri team are extending help to Joel and his family, but there is so much more to be done for others as well. If you’re still wondering how you can help, the Philippine Red Cross is accepting donations. You can also use your cellphone’s prepaid load or postpaid credit to send a donation. Text RED <AMOUNT> to 2899 (Globe) or 4143 (Smart). Denominations are 5/25/50/100/300/500/1000. You can also drop off donations in kind at any LBC branch nationwide. What people reallyneed now is clean drinking water. Check out SendongRelief.org for more ways you can help. Natural disasters come at any time of the year, but this season is supposed to be a time of celebrating with loved ones and remembering that Christ was born to lay down his life for us. Let’s lay down our materialistic desires and donate now to save others’ lives. The last time I used my passport was in 2008, and it’ll expire next year! So I’m really excited that it’ll make its last hurrah this weekend when I go to Malaysia for the Nuffnang Asia Pacific Blog Awards. Aside from hobnobbing with the who’s who of the Asia Pacific blogosphere and meeting fellow bloggers from other countries, I’m really excited to travel outside the country again. I’ve never been to Malaysia. The NAPBAS will be held at the Putrajaya Marriott Hotel (in a district 25 kilometers away from Kuala Lumpur), but we’ll be shuttling in and out of KL for the afterparty on Friday, and a guided tour on Saturday. I’ve got one free day on Sunday and since the Petronas Towers aren’t on the tour’s itinerary, hopefully a few of the Filipino bloggers will want to visit it then. 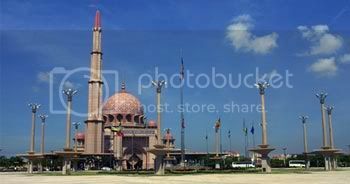 I’m also really looking forward to running Putrajaya’s streets and seeing buildings such as the Putra Mosque. Well, shoes can make or break an outfit, affect how you move, and are the only clothing item that won’t make you feel fat. My small closet space only allows me to buy new shoes only when old ones wear out, so this keeps my Imeldific tendencies at bay. I never buy really expensive shoes though. I know shoes wear out, some faster than others, so I try to find great deals for shoes. That way, I don’t feel too bad when I have to get rid of a pair of shoes because they’re old, or dirty, or discolored. I can always buy new ones! These three pairs of shoes are from Virtual Mae and I was able to buy them for P1,000. Yes, for all three! Multiply had a shoe fair early this year, and VM had a promo: buy two, get one more free. Aren’t they lovely? I also scour tiangge places for footwear. I found this pair at St. Francis Square. The quirky color combo ensures these sandals match almost anything I wear. The best part about tiangge shopping, though, is being able to bargain the prices down. For heels I like to shop at boutiques. I like being comfortable even in towering heels, and the boutiques usually carry a great selection. I’ve bought from People Are People numerous times, and what I like about the store is the sale prices — they slash about 50% off from tag prices after a certain time. These shoes only cost me P800! Just this week I bought myself a pair of low boots, and I waited almost an hour to get them because the stockroom had lost the partner of the boot on display. The salespersons didn’t even bother telling me why my shoes were taking so long to be delivered, and I had to call the manager’s attention to my long wait time. Well, after growing white hairs on my chin, I finally got my boots for less than P800. They are LOVE! I’m having my room remodeled in two weeks, but you can be sure I’ll always make room for shoes! What are your latest acquisitions?